Glass jars specially designed and heat-treated for use in home canning. Ideal for fresh preserving apple and grape juices. Ball's famous glass jars and closures go beyond fresh preserving to help you with serving, creative décor, and gift-giving. 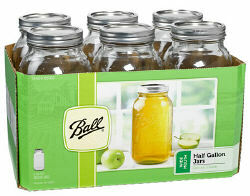 Wide mouth canning jars sold in pint, pint and a half, quart and two quart sizes. Includes one dozen jars, bands and lids (Pint & Quart ), six jars, bands and lids (Two Quart) and nine jars, bands and lids (Pint and a Half). Caps, lids, and rings are interchangeable with Ball or Kerr wide mouth jars. Sold by the case only.